It almost seemed that All-Season tires were going to become the answer for winter driving in America. Their promise of instant adaptability from one season to another combined with the popularity of vehicles equipped with easier to drive front-wheel, or four-wheel drive systems helped make the All-Season tire's traction level acceptable in light snow conditions. Then Bridgestone introduced a new type of winter tire, which in addition to its exceptional snow traction could even come close to equaling the ice traction of studded tires...without the studs. And by establishing a higher benchmark for dedicated winter tires, the Blizzak's exceptional snow and ice traction revealed the inherent compromises of All-Season tires. 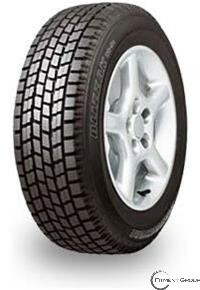 Today, the Blizzak WS-50 represents the second generation of Bridgestone's WinterBiter tires. So if you want to maximize all of your vehicle's winter capabilities, the Bridgestone Blizzak WS-50 will help provide the snow and ice traction you need. The Blizzak WS-50 in 80-, 75-, 70-, 65 and 60-series features a symmetric tread design while its lower profile and typically wider 55-, 50- and 45-series sized tires feature a directional tread design. Both of these tread designs use flow-through grooves to help maintain good traction on wet and slush-covered roads while their zig-zag sipes and independent tread blocks provide the edges to help bite through snow. The Blizzak WS-50 also features Bridgestone's Tube Multicell Compound, which helps disperse water to reduce the risk of slipping on the thin surface film of water that makes ice so dangerous. NOTE: The first 55% of the Blizzak WS-50 tread depth features the Tube Multicell Compound while the remaining 45% features a standard winter tire compound. The Blizzak WS-50 meets the industry's severe snow service requirements and is branded with the snowflake-on-the-mountain symbol. Install Blizzak WS-50 tires in sets of four only. Due to the revolutionary traction capabilities of the Blizzak, Bridgestone recommends using Blizzaks only in sets of four to provide the best handling characteristics and tire performance.